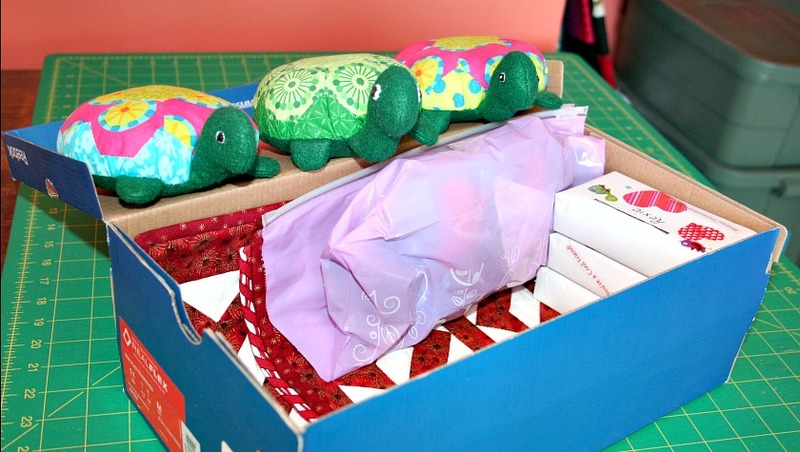 Hexie Turtle's Moving Adventure - Part 1 - Super Mom - No Cape! Lanie, Rexie and I have been having an awesome new adventure. Sue and Dave are moving to a new home and of course, we’re moving with them!!! We had the most fun making sure that Sue packed all of our things. 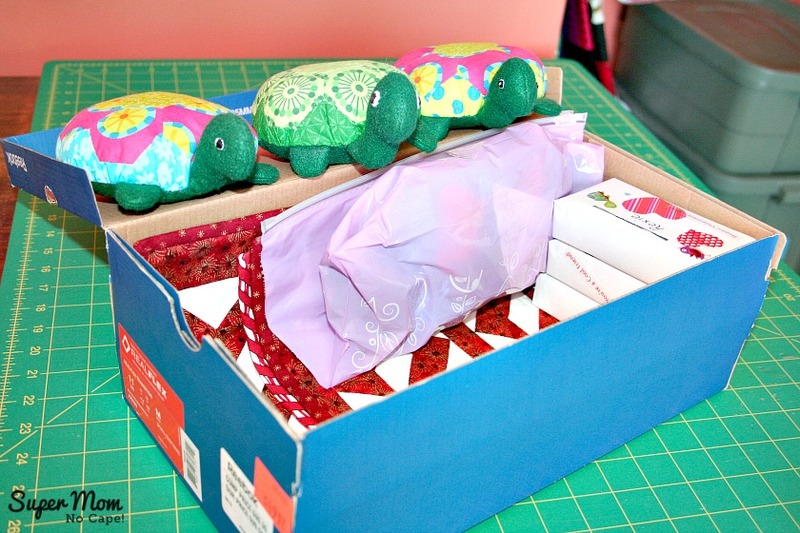 Turtles don’t need big boxes like Sue and Dave. All our stuff fit into a shoe box. Our quilts went in the very bottom of the box. You can read all about our quilts and see better pictures of them in Sue’s post called What To Do With Lots of Extra HSTs. All our clothes fit into a pretty purple zip bag. There were the mitts, hats and scarves we wore for our snow adventure. Our Santa hats that we wore to help Sue bake Christmas cookies went in next. 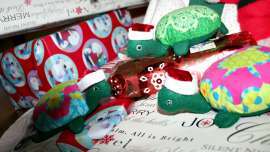 We wear our nightcaps every night but you first saw them in our Hexie Turtles’ Christmas Eve post. 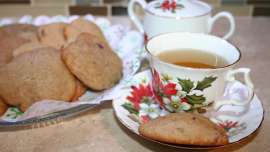 And the last thing to go into the zip bag were the chef hats that we most recently wore for A Hexie Turtle Valentine when we made Linzer Cookies with heart cut outs. We also made sure that Sue packed our Valentine’s letter boxes with all of our Valentine’s cards. Those are the boxes there in the bottom right hand corner of the picture. Sue asked us to tell you that she’s scheduled Vintage Embroidery Monday & the Stitchery Link Party for tomorrow like always but that she won’t have internet at our new home until at least Wednesday this week. She has lots and lots an lots of unpacking to do, so there won’t be any sewing, quilting, cooking or baking posts for a while. She did promise though to take pictures of us helping her unpack… so we’ll be back soon to tell you all about that part of our moving adventure! Too cute. I hope the turtles enjoy their new home. Oh gosh….what an adventure for everyone!!!! Have fun unpacking and getting back online. 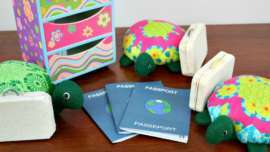 I love reading your Hexie Turtles stories. Please keep them coming! Good luck to all of you with the move. Hope to see you soon. I’m sure Sue and Dave feel happier for all that supervision…! HOpe the move goes well – at least you will have three turtles keeping an eye on you! How cute! Best wishes with your move! Hope all goes well with your new home. Safe trip. I wish you all the best for a smooth move and a happy settlement into your new abode. 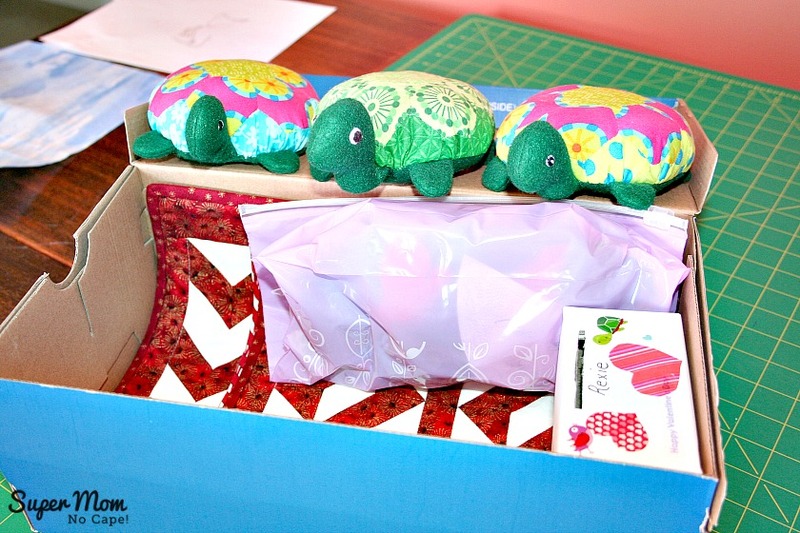 Ellyron (my studio dragon) sends the Hexie Turtles lots of good wishes in their new home too!